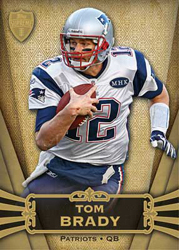 Back for a third year, 2012 Topps Supreme Football is led by the promise of a low-numbered hit in every pack. While there certainly are lots of rookies on the checklist, the hobby-exclusive set also delivers a solid amount of veterans and legends. 2012 Topps Supreme Football has just one pack per box with the big hit being either an autograph, relic or autographed relic. In every 16-box case, the hits are divided up fairly evenly. Each delivers four autograph relics, four rookie autographs, a multi-autograph, a single autograph, one other additional autograph and five relic cards. The 100-card base set mixes rookies, veterans and retired stars. The cards have a royal feel to them with a player image cast against a decorative gold background. The nameplate continues the theme, mixing gold and black. Every pack also comes with one of six parallels: Blue (#/99), Violet (#/75), Sepia (#/40), Green (#/15), Printing Plates and Red (1/1). Autograph Relics come in several different combinations ranging from single swatches up to six-piece book cards. Basic Autograph Relics have Blue (#/25), Violet (#/5) and Red (1/1) parallels. The Violet and Red cards feature patch pieces. The toughest signed memorabilia cards are the Autographed Double Jumbo Relic Book Cards and Autographed Six-Piece Relic Book Cards. Both sets are all one-of-ones. 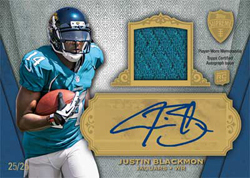 Supreme Rookie Dual Autograph Die-Cut Relic Book Cards include two autographs and two over-sized swatches. Die-cut player images are layered on top of the relic swatch. The end result is similar to the Silhouette cards made by Panini, only flipped horizontally and doubled up as a book card. Each is numbered to 5. Similar versions without autographs are also available. More than 30 first-year players have Autographed Rookie Cards. They have the same colored parallels as the base set except for no Sepia cards. Rookie autograph parallels are also more limited than the base parallels. More than 15 veteran and retired players also have autographs, including Joe Montana, Jerry Rice and Roger Staubach. 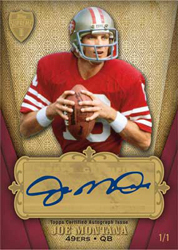 The most unique addition to 2012 Topps Supreme Football are the Autograph QB Playbook cards. Featuring a checklist of seven players, the black cards are signed in silver. They've also added a diagram of their favorite play. Also new to the set are Nickname Autograph Book Cards. These cards, also printed with black backgrounds and silver signatures, are inscribed with the player's nickname. Multi-autograph cards include up to eight different signers. Six Autograph cards are double-sided. Eight Autograph cards are designed as booklets. Twenty-five legends occupy the Hall of Fame Cut Signatures checklist, each of which is limited to one copy. Both the Rookie Quad Relic and Rookie Quad Combo Relic sets have large checklists of more than 30 players. Each has four swatches with Quad Combo cards having multiple players. Premium memorabilia cards include Jumbo Supreme Patch Cards that have a large, multi-colored jersey swatch and are numbered to 5. Veteran Quad Relic Cards, Six-Piece Double-Sided Relic Cards and Eight-Piece Relic Book Cards both have Red patch parallels that are limited to one copy. 2012 Tops Supreme Football also has a pair of one-of-one relics: Letter Patch Cards and Primary Pieces. 2012 TOPPS SUPREME RUSSELL ROBERT TURBIN ROOKIE AUTO # 18 25 Only 25 Made!!! 2012 Robert Turbin 1 1 Topps Supreme Auto RC!!! Good: Huge checklist. Multiple variations of base, autographs, and game-used cards to chase. Fewer prospects than earlier products. Nice mix of rookies, stars, and legends. All cards are serial numbered. Bad: Sticker autographs. Too many single-color game used swatches. Price doesn't justify the sole hit card inside. The Bottom Line: 2012 Topps Supreme Football is a nice product. Many football collectors will find something to like, but the higher box price may limit the actual collectibility of the product as a whole. The cards are printed on thick stock, which makes for a nice feel in your hands. The images are very sharp with crisp colors. Each base card features an action pose, with veteran players set against a gold background and rookie players backed by a gray background. Base cards also contain a nice gold foil plaque at the bottom of the card that features the player's name. The one hit in our box was a Veteran Quad Relic card. The design is very similar to the the regular base card photo and background with a large four-piece swatch in the middle. Even though we didn't pull any autograph cards in our box, there are many that look absolutely stunning in person. The Autograph Relic Patches, Triple Autographs, Eight Autograph Booklets, and Supreme Rookie Dual Autograph Die-Cut Relic Booklets look awe-inspiring up close. Because Supreme comes out at the end of the football season, the rookies that made an impact in the league have been identified and are reflected in the checklist alongside the established stars and legends. The product also includes some top-level retired autographs, including Joe Namath, Joe Montana, Jerry Rice, and Warren Moon. With only get four cards per box, including one parallel card and one autograph or memorabilia card, the price of this product is pretty steep. Factoring in the chances of getting a good card that you'd want to collect or that you can resell for a profit, the risk is very high. Volume purchasers seeking the big hits will not mind the price as much as the casual player or team collectors. While all the cards are numbered, the hits in each box generally feature a lower print run. If a star player autograph or multicolor patch is found inside, the price of the box could be more easily justified. The anticipation is high for a product like Topps Supreme, but there are only four cards in the box, so the fun is over very quickly. Ripping a box of 2012 Topps Supreme Football is a lot like opening presents on Christmas Day. The excitement level is strong, as you might get that new Xbox you were after. But at the end of the day, you still may end up with only a pair of socks. Kendall Wright Topps Supreme 2x Jersey Patch Auto Rookie TRUE #1 1! Titans STAR! How can Topps not have the Defensive Rookie of the Year Luke Kuechly???????????? Is this final checklist? Great experience with this product. Beautiful base cards. My hit was a cut signature auto 1/1 of Wellington Mara. Great hit can’t complain!!! Pulled a Auto Memorbilla Russell Wilson redemption today! Was very excited! Can’t wait to see what it is! I really like the design of the cards and Supreme has been good in the past but for $100 it is just not worth the risk with so many more boring jersey cards per case. I busted one and pulled a Dwayne Allen Jersey Card. That was the last Supreme I will be buying. Just an awesome, gorgeous product. Best of the year, IMO. So found out 3 weeks ago When I pulled the Autograph Russel Wilson memorabilia. It is a Full Game used Jersey autograph 1 of 1! Just wanna let you guys know!! Who knows what value is on that??! I heard so many numbers from $200- $8,000. I was told that Russel Wilson has to decide what game jersey he wants to give. Of I can post pics on here when I get it I will. Had anyone else pulled one of the Autogame used full jersey?! Congrats! Value will be tough to gauge until it or others like it from comparable players are sold. Also, have you confirmed it’s game-used or player-worn like at the Rookie Premiere? Topps had told me that it was “game worn” and that it was up to Russel Wilson to decide which jersey he wanted to send from what game, and that all the jerseys are 1 of 1. ya as far as the value who knows!! I mean the guy at the sports store I bought it from told me $4,000 grand but pending why game it’s from n if he writes stats on the jersey. I had put it on eBay the redemption card and got stupid offers like $75-$250 lolol so I redeemed it and I figure pics are with thousand words to people. My rating of 4 stars is due to my comment above. When purchasing a high end product, whether it’s Panini or Topps, it should and must be an on card auto. Photos do no justice to these beautiful cards. I stayed away from purchasing this product due to the photo I’ve seen. Up close and in real time? Absolutely fantastic! It’s a little busy but well executed in style. Card stock is top notch as well as the condition it was delivered in, luckily no chipping. As always, when purchasing high end products, you do so for the enjoyment of it. If you expect big hits, there will be frustration as not every box will provide you with the so called $500.00 hits. As for my hobby box break? Base cards are as follows; Dwayne Allen 144/462, A.J. Jenkins 142/462, Von Miller 64/75, and a dual auto card of Rueben Randall and David Wilson 19/25. Although price guides do not have any information on this set, I did see an exact dual auto card like mines on ebay going at a buy now cost of $40.00. Not too bad at all! 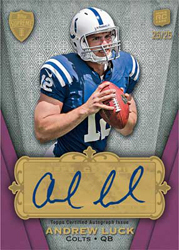 Any idea what the Andrew Luck ‘Autographed Rookie’ SRA-AL 1/1 (Red) would sell for? 2 - 2012 Topps Supreme Football Sealed Hobby Box - WILSON & LUCK AUTO ROOKIES!